Wii Sports has been bundled with the Wii since it’s first introduction in the UK I believe, so most people that have a Wii will have played one or all of the Wii Sports games. Our favourite, the game we keep coming back to, is Wii Sports Tennis. I had toyed with the idea of getting a Wii some months back, but thought that as I already had an Xbox 360 it would be a bit too much of an indulgence. Then my girlfriend and I had a chance to play on the Wii Fit and Wii Sports at a friends house on New Years Eve. I knew then that we would have to have one. 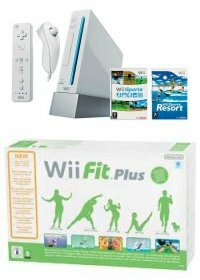 The Wii Console bundle on sale at the moment is the Wii Sports bundle; including a console, controller, nunchuk, Wii Sports and Wii Sports Resort which itself includes a MotionPlus adaptor (used by some of the games in Wii Sports Resort). We also picked up a Wii Fit Plus with Balance Board and a second controller (Argos didn’t have extra nunchuks or MotionPlus adaptors seperately), a charging station for the controllers and 2 games bundles. This has made the Wii a quite expensive purchase, but it is likely to get more usage from both my girlfriend and I than the Xbox 360 does at the moment.